Before the wines even finished fermenting 2O13 was widely hailed as a legendary almost picture perfect vintage for Cabernet Sauvignon in California. In this, yet another in a succession of drought years, the Cabernet vines produced ultra-concentrated grapes that balanced richness with structure. It was a growing season where both Napa and Sonoma were fortunate to have avoided the troublesome heat spikes that they have often experienced recently, so acids came in naturally a bit higher than average, with the result being wines that tasted less cumbersome and fresher. Tannins were also ripe and abundant, suggesting a Cabernet crop built for the long haul. Winemakers and influential critics alike almost unanimously considered 2O13 to be a year of miraculous quality that had everything going for it. In my experience over the years, it’s always dangerous to make blanket judgments about serious Cabernet-based wines in their youth, especially soon after harvest. The story emerges slowly, is never crystal clear and its details change. A mysterious but well-documented transformation occurs as wines of this type evolve in bottle, an oscillation between opacity and openness that confounds prediction and should be humbling to anyone who tries to evaluate them. 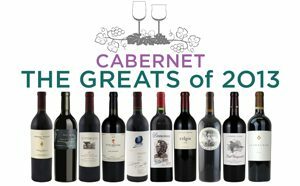 A recent retrospective of some of the most highly rated consensus favorite 2O13 California Cabernets raised some questions for me about this almost universally revered year, at least from our current vantage point. My overall impression was that many wines remained in an awkward stage. No surprise. It was easy to see how “correct” they were in terms of structure, but the sensuality, the vibrancy, the fruit itself in some cases was masked. Tasting the also highly acclaimed 2O12s at a similar stage revealed more up front charm. The 2O13s overall seemed more “classic” in personality, but as a group they also failed to exhibit the same “deliciousness” factor that so many 2O12s did. Conventional wisdom suggests that 2O13 is a vintage for the ages, a group of wines that require significant bottle development, while 2O12 is a vintage to drink with pleasure at any time. I’m not so sure. Alcohol levels for many of the top 2O13s seemed to me just a bit excessive, and in some cases the obvious structural underpinnings overwhelmed what I took to be a lack of vibrancy in fruit expression. That said, the 2O13s are highly sought after by collectors and virtually all were impressive in one manner or another. The following were tasted blind in August 2O18 and are described in ascending order of preference. This acclaimed Oakville district Cabernet came across as particularly hard and aggressive, with strong alcohol and tannin but lacking in fruit expression at present. Floral, tobacco-like and black cherry-scented, it had undertones of damp earth, mineral and balsamic notes, while the fruit came across as blunt and impenetrable. A full-bodied wine that finished with some spice and heat, but showed very closed and backward. To be re-evaluated. AVAILABLE FROM Carolina Wine & Spirits. The aromatics expressed a brilliantly nuanced and promising potpourri of red currant, peony, cilantro, lavender and rosemary. Smooth in texture, with restrained tannin but strong tart acids, this tasted curiously lacking in mid-palate generosity. The usual opulence that this wine exhibits was either masked, or not fully realized in 2O13. Puzzling for its austerity, even at so early a juncture, this has all the hallmarks of a brooding young Cabernet that remains stubbornly in its shell. AVAILABLE FROM United Liquors. This has classic violet, black currant, ripe, subtly spicy aromas that draw you right in. Medium in acid, the dark fruit peeking through is clean and nuanced, with brilliant spice tones on the finish as well. Everything you want in a Cabernet is present and harmonious, although its expression is quite tight and almost one dimensional at present, with the strong tannins, oak tones, and firm acidity hiding much of the fruit. AVAILABLE FROM Carolina Wine & Spirits. This wine is a bit more advanced in color (due to the inclusion of over 2O% Cabernet Franc?). It has an intriguing earthy aroma of bay leaf, mushroom and smoky dark super ripe berry fruit. Acids are plentiful, and there is a somewhat leathery, concentrated black fruit note to match the strong tannins. Bold, dense and powerful, but with elegant, balancing hints of floral and foresty nuances. AVAILABLE FROM Winebow. Always one of my favorites, this proprietary blend has a glowing ultra-ripe personality in 2O13 with notes of dried fruit, roasted plum, stewed berries, mineral and earth. It’s chewy on the palate, with silky red and black fruit sensations, excellent structure, and grace. Tannins are strong but rounded. Harmonious and pure now, but even more promising for future development. AVAILABLE FROM Carolina Wine & Spirits. Impressively aromatic and beautifully structured, the 2O13 Dominus exudes licorice, black fruit, mint leaf, smoke and anise on the nose. It was showing much more openness and generosity than some of its peers, with a gorgeously round creamy texture, dark cocoa, and clove notes balancing the massive black berry fruit. Atypical of many other young vintages of Dominus I’ve tasted, which notoriously require time in the cellar, this is actually showing some beautifully forward fruit notes. AVAILABLE FROM Ruby Wines and United Liquors. It’s always wonderful being able to taste the legends blind in order to understand how they achieve greatness. The first notes that come off the glass are wood derived: vanilla and caramel. Then a wave of perfectly ripe sweet black fruit wafts up. Finally undertones of cedar and tobacco. This is supple on the palate, clearly ripe and luscious despite the prominent youthful tannins. A wine that keeps on revealing more of its personality with each new sip, big in every sense, but also sensual and velvety on the palate. AVAILABLE FROM Horizon Beverage Company. Shockingly good! Brilliant and dark in color, with bacon, blueberry, smoke, vanilla, espresso and powerful spice accents, it’s pure velvet on the palate. The flavors are a subtle interplay of black fruit, game, and clove. Tannins are very concentrated, but soft and ripe. A beautifully integrated wine, with terrific concentrations of acid and tannin, rich but subtle, and long in the finish. AVAILABLE FROM Horizon Beverage Company.